Leave for 12-16 hours in a cold kitchen; 6-10 hours in a warm one. Mix all ingredients together, except the salt. Leave the mass of dough to rest for 20 minutes, sprinkle salt on top and knead it in for a couple of minutes until smooth. You can use a KitchenAid in low-speed if you like. Ferment the dough for 3 hours, with two folds (at 60 and 120 minutes). Leave the dough rise undisturbed for the last hour. Weigh the dough and separate a small amount roughly 10% of its weight for the braid. Divide that portion in three, make long strands with it, and form a braid. 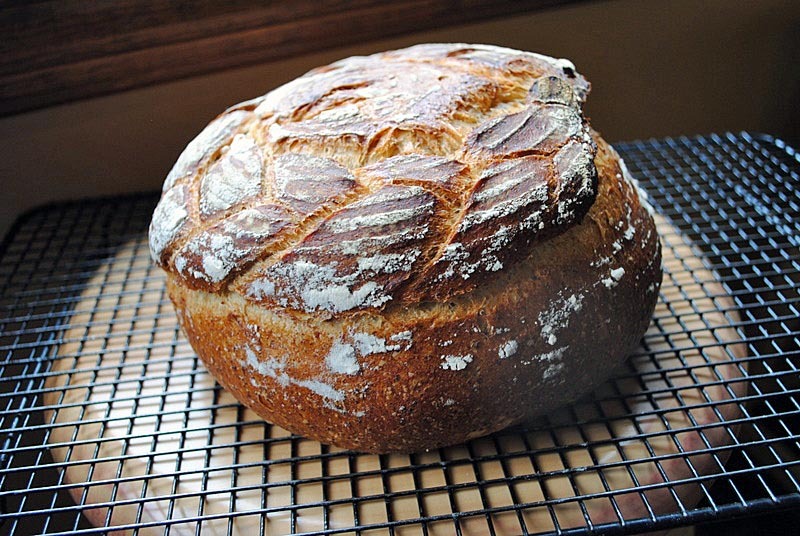 Place the braid at the bottom of a well floured banetton, form the remaining of the dough as a ball, and place it, seam side down over the braid. Ferment the shaped dough for 2 hours, invert it on a piece of parchment paper, and bake in a 450 F oven with initial steam for 20 minutes, reduce the oven to 420 F and bake for 20 to 25 minutes more. Cool completely on a rack. 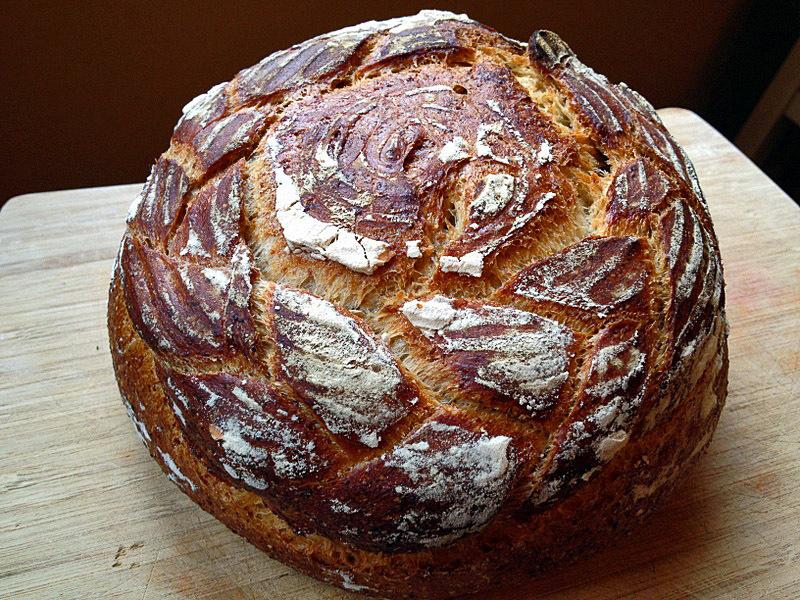 This was a nice loaf of bread, with the delicious flavor of rye, and a golden brown crust, boosted by the inclusion of malt. 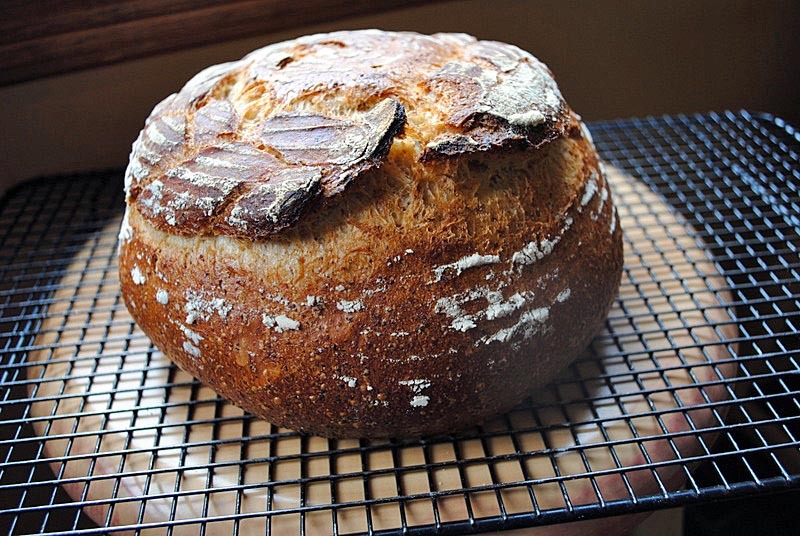 I baked it inside a large roasting pan with a lid, after a nice comment left by Donna on my sourdough mini-rolls post. It worked extremely well, thanks for the great tip, Donna! I did not add any extra water inside the pan. I just poured some inside the lid, emptied it leaving a little water clinging to the surface, and inverted it quickly to close the roaster. At the end of 20 minutes I opened the roasting pan and continued baking uncovered. I especially like the pic where ou can see the ends – it really does look like a crown! YUM! The bread looks unbelievable fantastic! That is really something, Sally, and I’m not just talking of the bread’s shape — though that is great! With those ingredients, I bet the loaf has a ton of flavor, too. Flavor was amazing, the rye always contributes a lot to a dough, and the malt syrup is a great touch. Cannot thank YOU enough for the inspiration, of course… what a cool method! Wow! It looks so pretty sally! Turned out pretty nice indeed… I added a lot of flour to the banetton, was afraid of the braid sticking and the ball of dough falling off, but apart from a little sticking in one side all went fine. Here it is, Debby… you can kind of see it at the corner of the picture with the braid resting on the counter. I use it all the time during the Fall and Winter. I am always stopping by Zeb Bakes, not only for the breads, but she sneaks photos of her dogs too, so cute! I’m a sucker for a good sourdough.the crust on that loaf looks heavenly! 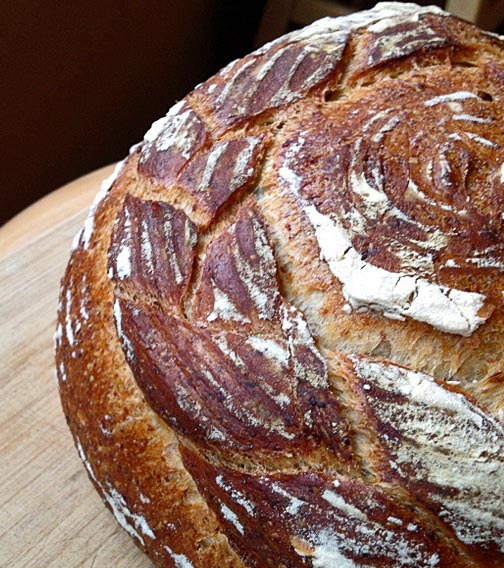 For me, the crust is the most important component – and this one delivered everything I like in this type of bread.